Cinematic Autopsy: Return To Nuke 'Em High Vol. 1 Blu-ray & DVD Release Date and Details! Return To Nuke 'Em High Vol. 1 Blu-ray & DVD Release Date and Details! Oozing on Blu-ray™ and DVD March 18th! His name is legendary. He’s created some of the most iconic films and characters in all cinema, including the Toxic Avenger and Sgt. Kabukiman NYPD. His name is Lloyd Kaufman and Anchor Bay’s got him! Anchor Bay Films proudly announces the return of Lloyd Kaufman to the theatrical feature director’s chair with the March 18th Blu-ray™ and DVD release of Return To Nuke ‘Em High, Vol. 1. The cast includes Catherine Corcoran (The Lovely Bones), Asta Paredes (Occupy Cannes! ), Debbie Rochon (Tromeo and Juliet), Motorhead’s Lemmy Kilmister and introducing Kevin the Wonder Duck! 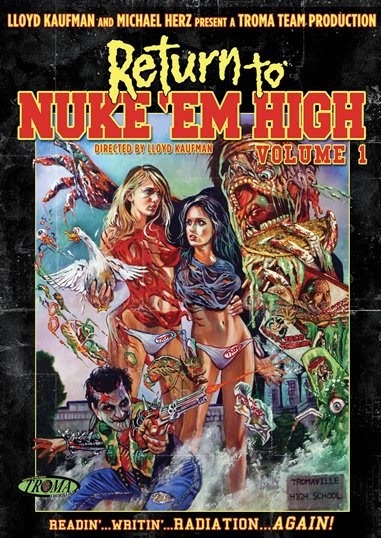 Fresh from exclusive theatrical engagements in New York, Los Angeles and other major markets, and still playing in exclusive theatrical engagements all over the world (while receiving excellent mainstream reviews http://return2nukeemhigh.com/press), Return to Nuke ‘Em High, Vol. 1 – presented in all its director-approved, unrated glory -- graduates with an SRP of $24.99 for the Blu-ray™ and $19.98 for the DVD. Pre-book date is February 19th. Welcome to Tromaville High School. Your typical high school populated with your basic football jocks, wannabe prom queens and glee club hopefuls. Did I say “typical?” After all, this is Tromaville High, where the glee club has mutated into the hideous Cretins after eating tainted tacos courtesy of the Tromorganic Foodstuffs Conglomerate. Chrissy and Lauren, two innocent lovers/bloggers, must not only fight the adolescent beasts and freaks, they must also defeat the evil Conglomerate. Will they, along with their mutant pet duck, save Tromaville High and the rest of society? Return to Nuke ‘Em High, Vol. 1 has it all – satire, sci-fi, plenty of Troma’s world famous green goo, themes of anti-bullying and LGBT rights. If that isn’t enough, how about death by glee club, high falls, meltdowns and fiery explosions? Wait there’s more! There’s plenty of exposed teen viscera (and breasts!) and love triumphing over prejudice. Just like The Breakfast Club, Ferris Bueller’s Day Off and “Glee” – only 100% Troma style! Return to Nuke’Em High, Vol. 1 was selected by the Museum of Modern Art as part of their prestigious 2013 “Contenders Series,” an annual collection of visionary cinema, selecting influential, innovative films made and released during the year. 2014 also marks the 40th anniversary of Troma Entertainment, the longest surviving independent film label.